The existing infill warehouse (surrounded on three sides by existing units on the site) consisted of an asbestos roofed double portal framed structure with multiple haphazard additions which were bolted on during its lifetime. Over the course of many years this structure was used for a variety of functions for the business owner. Its current usage was primarily storage but this warehouse was also utilised by the office workers as through route to gain access to the larger units to the rear of the site. The brief for us seemed like a simple one, provide office space and a showroom. Once we removed the existing warehouse, including its asbestos roof, we ensured that any additional interventions would maintain as much natural light as possible whilst maximising the commercial potential that the existing site boundaries would allow. The client requested that the new warehouse was separated into three distinct spaces; additional office space, a showroom and a meeting room. Our solution was to locate the new meeting room adjacent to the existing loading docks to maximise natural light and provide a new space to meet before moving into the showroom. 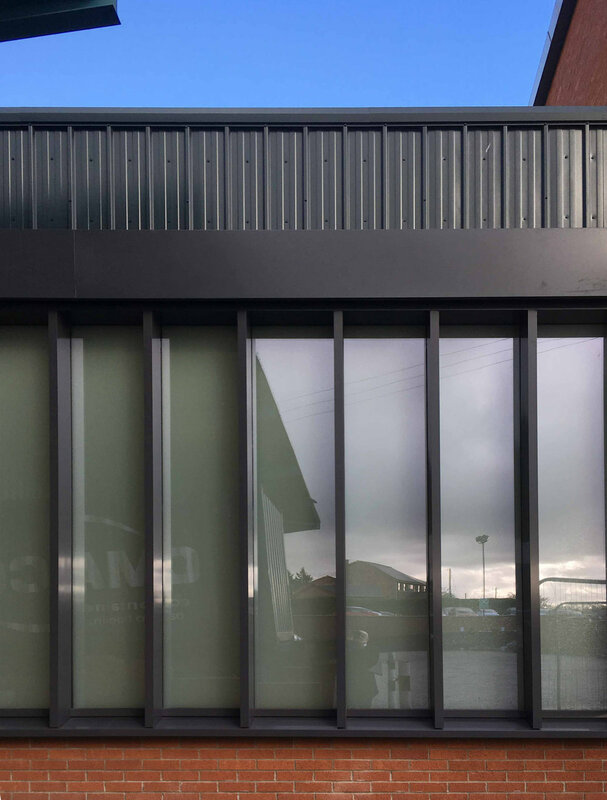 We utilised translucent glazing adjacent to the loading dock to block unsightly views but maintain the filtering of natural lighting whilst opting to implement transparent glazing to one end to direct views to the countryside beyond. The showroom itself was kept simple and light filled to allow the clients products to become the focal point. The addition of acoustic panels allowed for better conversation, and a tracked lighting system gave the clients the flexibility to alter their product arrangements. On the opposing side of the warehouse, the office spaces and staff amenity area maintain a visual connection to the outside and the showroom via a full height glazed corridor. The rationalisation of these distinct spaces has been the ultimate success of the project allowing the client to effectively use this once awkward infill space.